A visitor at the International Non/Fiction Book Fair. The 17th annual literary fair features a new section designed to appeal to gourmands. 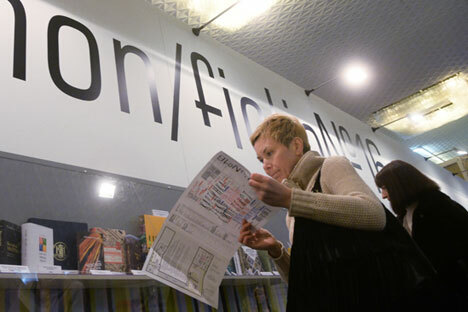 Moscow’s Central House of Artists traditionally hosts an international book fair for high-quality fiction and non-fiction at the end of fall. From Nov. 25-28 visitors can take part in 400 events, including book presentations, seminars with authors, talks and lectures about current topics in contemporary literature and publishing. Non/Fiction will be attended by 250 publishing houses from 24 countries, and its special focus will be Spanish literature. Famous writers and linguists such as Juan Bas, Georges Nivat, Diego Muñoz and Franz Hohler are due to attend. Children’s literature will receive a lot of attention again this year, and there will be seminars with writers and book illustrators, master-classes, quests and games on the “territory of knowledge”. Participants will include the famous illustrators Émile Bravo and Tito Alba, and the paleontologist Jørn Hurum, who has done a great deal to popularize science. A special section called Gastronomie will feature for the first time, where visitors will be invited to explore the connections between a country’s national cuisine and its historical and cultural traditions. Visitors to the fair will also be able to buy antique books and visit the Vinyl Club, where unusual and rare vinyl is sold for cheap prices.